Hide deals from seller "Pilsen Red Hots"
Hide deals from category "Hot Dogs"
Limit 1 per person and 1 per transaction. Valid on any menu items. New customers only. Dine-in only. Full value of Gift Certificate must be redeemed in 1 visit. 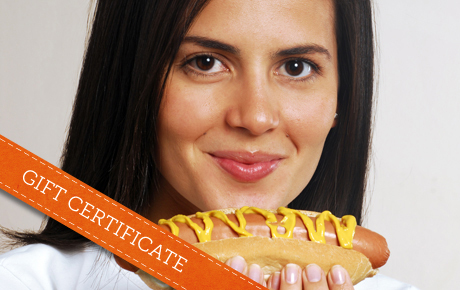 Quiet your craving for good food with this deal for 50% off a $20 Gift Certificate from Pilsen Red Hots in Chicago. Recently opened, this restaurant boasts a menu full of Chicago favorites for meat and veggie lovers alike. At Pilsen Red Hots, Chicago-style dogs are a specialty and a customer favorite. They offer other mouthwatering meals including hot wings as well as chicken Philly and Reuben sandwiches. Vegetarian options include burgers and hot dogs, which leave out the meat but not the flavor. Add to these meals with gravy bread, chili cheese fries or any other delicious side. You can also serve their appetizing meals at your next party with one of their party pack options. Titillate your taste buds with this delicious deal. A restaurant in Pilsen that serves burgers, hot dogs and vegetarian meals.